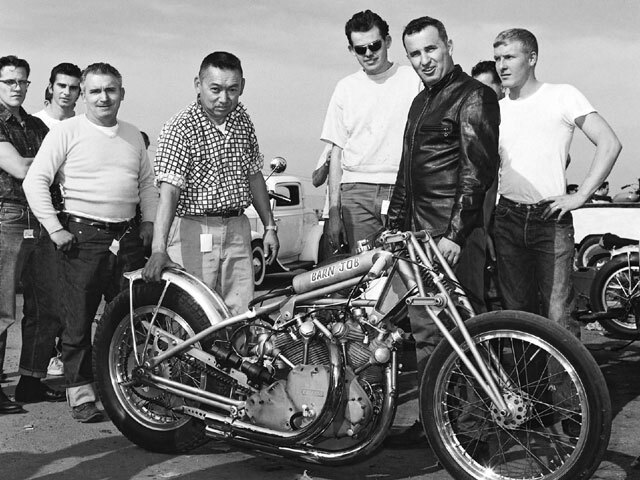 Back in the 60s and for 5 years, “Barn Job” was the Number 1 Drag Bike in the world, simply because it was the first drag bike to exceed the speed of 130, 140, 150 and even 160 mph in drag race. However its most significant milestone was certainly to be able to fall first the 10 seconds wall in the quarter mile when the displacement was increased to 85 ci (9.82s at 151.51mph). One man was behind all these achievements: Clem Johnson. 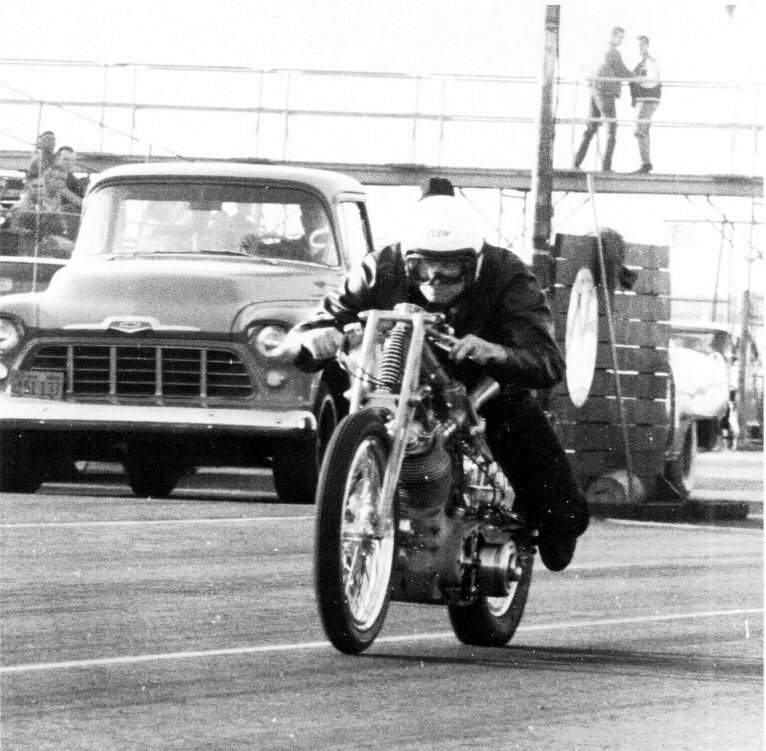 Clem developed and built his Drag Bike from a 1949 Vincent Rapide that he bought in 1954, after being released from his military duty. 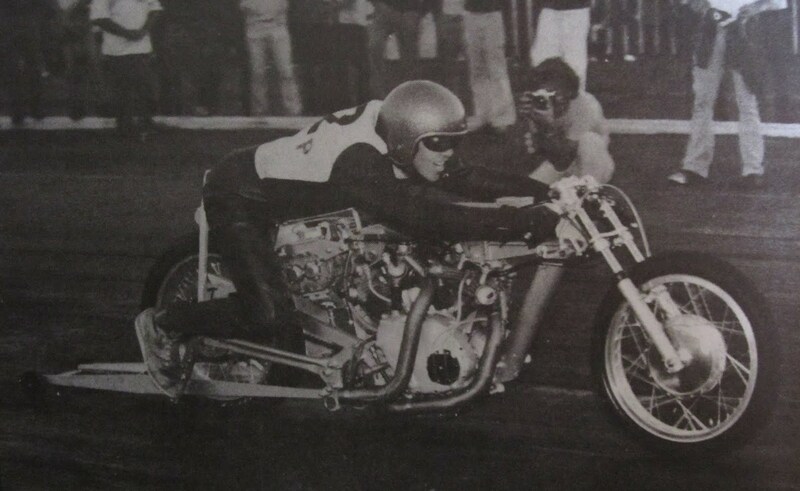 During the bike racing career that spanned 33 years, Clem Johnson assisted by his partner Ralph Owen made constantly modifications to improve its performance: the weight melted from 403 lbs to 260 lbs, the displacement increased from 61 ci to 96 ci, the injection of Nitro-methane doubled the power from the base line, the stock frame was replaced with a custom aluminum frame, a supercharger was added, Injection replaced the carburetors, in fact the list of modification is far too long to be listed and eventually only the crankcases and timing cover were remaining from the original Vincent works. 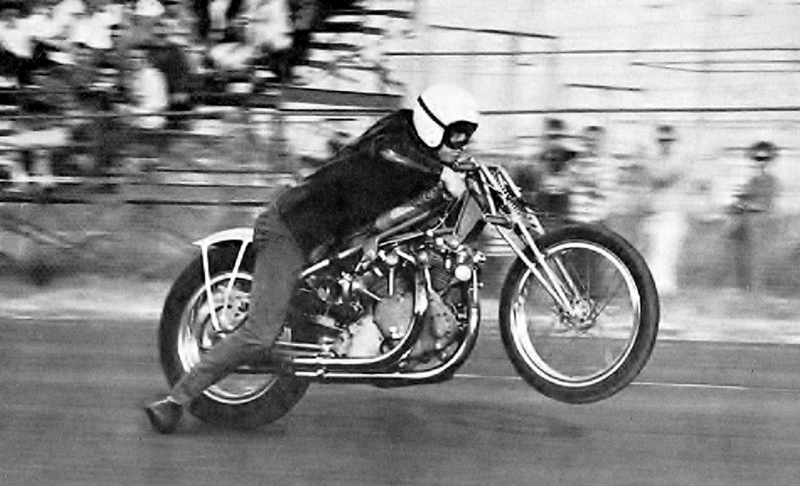 Clem raced the bike between 1955 and 1969 and handover Barn Job to his friend racer Jim Leineweber. However he continued to prepare the bike and manage the racing team until the last run was in 1987 with Jim Leineweber. 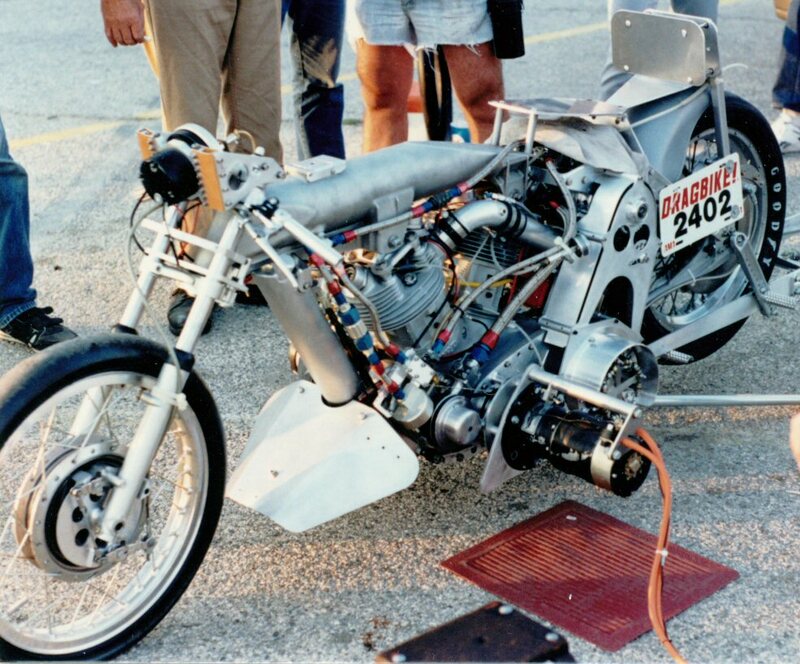 By that time, its quickest run was 8.40 seconds and its fastest 187 mph, quite an achievement for a bike with a narrow rear tire. Clem passed away on Dec 2, 2013 after making the necessary that Barn Job will find the home it deserved and John Stein, a Dragster enthusiast, was chosen for that purpose. 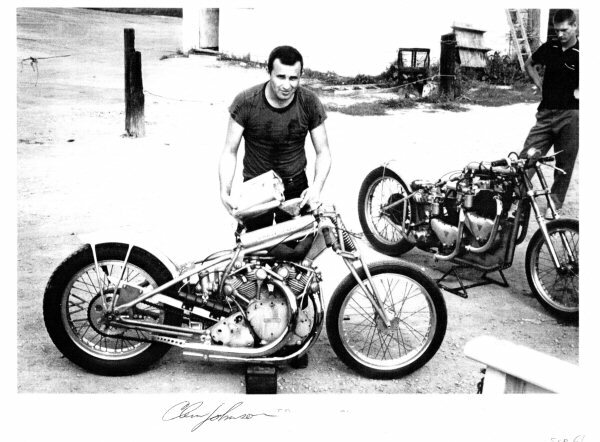 Clem will remain in many’s memory as one of the most talented Drag racers and definitely one of the most brilliant craftsman; his bike, Barn Job is still there to testify his legacy. Photo courtesy of Jim Leineweber photo archive. Clem Johnson riding Barn Job off the line at Long Beach California. Note that there is no front brake system on the bike. 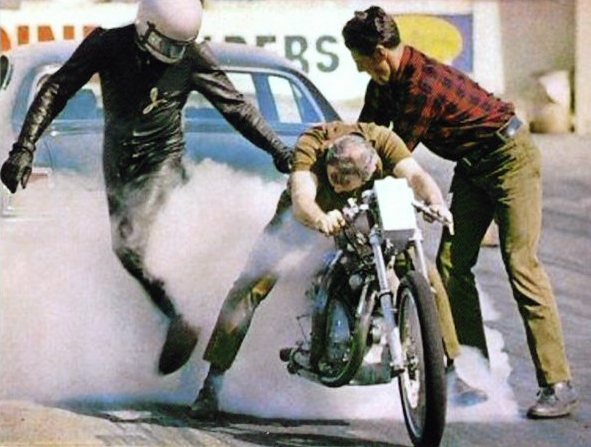 This photo taken in the early 1970’s shows Clem Johnson doing the burn out, between Jim Leineweber (L) and Ralph Owen (R) This photo was once used on bubble-gum trading cards. Clem Johnson dragging feet and catapulting Barn Job in the quarter mile. Jim Leineweber a few years later. You can see the evolution of the bike between this picture and the previous one. In 1987, at Palmdale, California, Barn Job made it’s last pass. 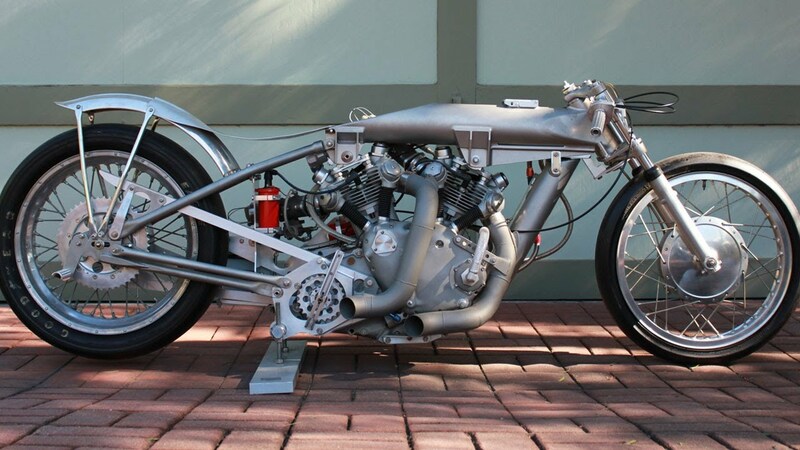 Here’s the bike in it’s final form after 3 decades of evolution. Note the supercharger under the drivers seat and no front brake. Note the belt driven fuel pump on the left of the primary transmission as well as the aviation flexs that feed injectors. The upper spine holds the nitro-methane while the vertical one in front of the engine holds the oil. The Nitro double the horse power than the engine is capable to deliver with regular fuel. The frame is all made of aluminum. Carburetion: Dellorto carburetors then Hilborn injectors. Nitro-methane was used from May 1962. Firing: each cylinder has its own complete ignition system with a common battery. Wheels: Borrani aluminum wheels with 2.75×19-inch Avon front tire and a worn-smooth 4.00×18-inch Dunlop Universal at the rear. The Brampton girder was replace early on by a welded aluminum alloy replica, which is shown in the above photos. 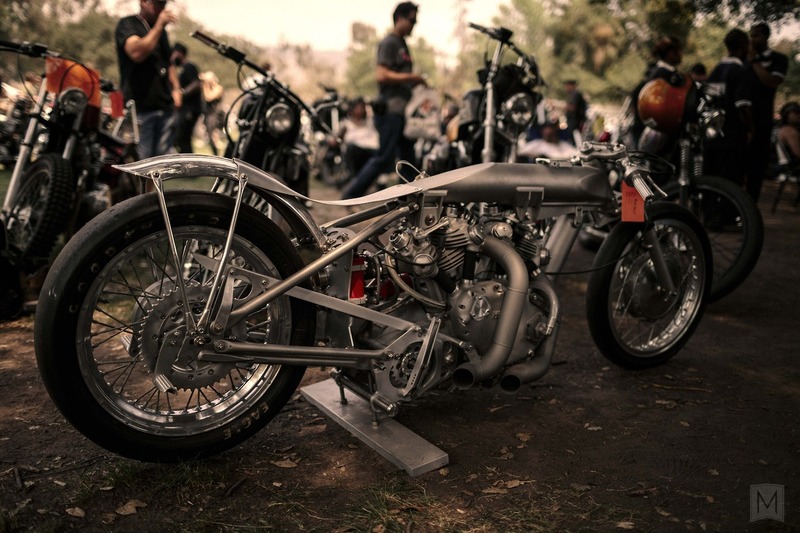 I have never seen a photo of the bike with a standard Brampton. Back in the early 80s I had a Pro-Stock Suzuki GS-1000. It was always fun watching the Barn Job make 170+ mph smoker runs. We were at the front of the lanes for the AMA Dragbike! national at Las Vega waiting to make a run and the Barn Job crew was trying to get her started up. They were cranking the bike over when there was a boom and suddenly there were guys running in all directions with their hands over their heads. Half a cylinder head had launched and nobody wanted to be under it when it came back down.